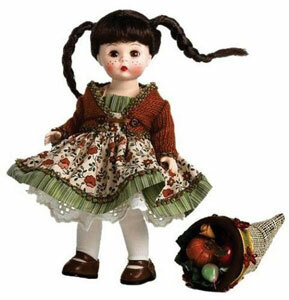 Thankful and Delightful: A charming and nostalgic doll salute to Thanksgiving dolls, past and present. 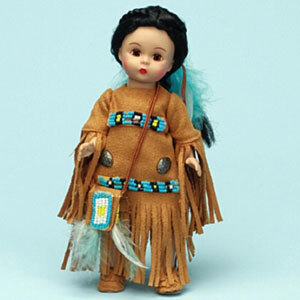 Known as “dolly mama,” photographer Debbie fashioned these Blythe Dolls as a charming Pilgrim and Native American pair. 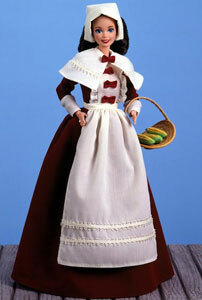 Dressed in bonnet and bows, Barbie does Early Massachusetts in the fashionable Mattel way. 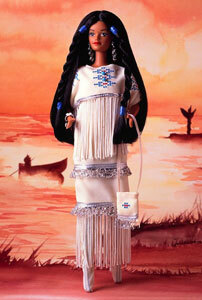 Twenty years ago, Mattel unveiled its first Native American Barbie Doll line. Here is the 1993 first edition. Madame Alexander crafted an adorable Wendy-inspired version of a Native American Thanksgiving friend. The stylists at Alexander also concocted a Cornucopia Thanksgiving pairing. Mattel has fun with the wee Kelly doll. Here she is garbed as a male and female Pilgrim, as well as a Thanksgiving turkey. 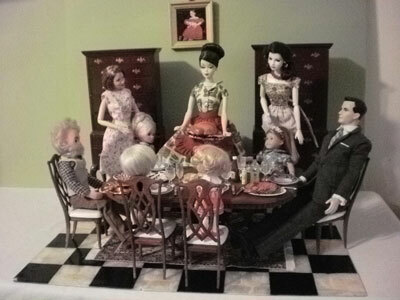 The 2010 Barbie Club special doll was the sophisticated and skillful Holiday Hostess Thanksgiving Feast. Via Karen, Mom of Three’s Craft Blog, comes this blending of history, child’s play, and fantasy: a time travel version of the First Thanksgiving dinner. 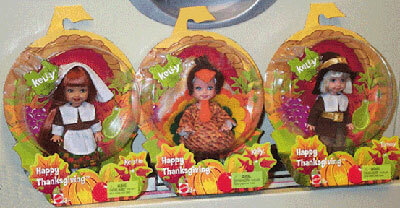 Heartstring Dolls are decked out as the First Thanksgiving participants. 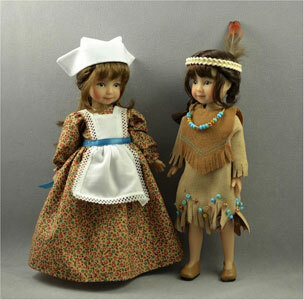 Featured on Jo’s Doll Shoppe site, the Pilgrim and Native American are positively charming. My Sunday nights used to be peaceful ones. That is, if you consider an hour spent watching zombies chomp on limbs, only to be stopped by a swift blow to the skull, as a restful endeavor. To me, unwinding before “The Walking Dead” was something I looked forward to on Sunday evening: an hour of uninterrupted, unblemished carnage and social commentary. However, during the last few weeks, I’ve found my Sunday nights to be anything but relaxing. My son (who is now in the fifth grade) has started the procrastinating that defines all adolescents and many adults, too. Just as he’s about to head up to bed—at 8:45, 15 minutes before “Dead” time—he will now announce a major school project that he neglected to finish, fine-tune, begin, or sign up for. It’s been a nightmarish month or so, because the assignment amnesia has fully impacted my precious zombie immersion. Yes, I am now in the throes of a pre-teen who can recall the high score he achieved on a Nintendo game played two years ago, but can’t remember he has a Thanksgiving Pilgrim Poster due on Tuesday. It is getting extremely scary and frustrating. That’s why I’m looking forward to Thanksgiving this year. I know that the Thursday to Sunday mini vacation is a break that I need to settle my schoolwork nerves. Having graduated from college more years ago than I care to calculate, I now find myself firmly back in the fifth grade having to scramble for answers and arts-and-crafts techniques that I never knew I possessed. I’m hoping that I can wrestle the actual homework from my son before we head off for the Thanksgiving dinner at my family’s home. It is a wish for harmony and order that I have that rivals the Pilgrims’ optimism about settling in a brave new world and living in harmony with unfamiliar and unknown tribes. Sure, I know that the Pilgrims had to travel aboard a primitive vessel, endure stormy seas and terrible weather, survived shipboard disease, and then touched down upon rocky, seemingly inhospitable terrain. They had organized and signed the “Mayflower Compact” to make sure that all of the new arrivals were on the same page regarding their intent and purpose for colonizing. That’s what I want from my son—an agreement that we’re on the same page about homework, time it takes, supplies that are needed, and grades that are expected. Oh, my, if that happens, how thankful I’ll be! Putting aside my own selfish holiday wishes, I also look forward to Thanksgiving because it’s a time to take stock of where we are as a culture, a nation, and a beacon for opportunity around the world. Thanksgiving is a moment when we can unplug from Yahoo updates and Google searches and examine how fortunate we are to be living in the United States. Despite all the acrimonious news emanating from D.C., we’re still citizens of a country that stands as the welcoming, wished-for home to millions of dreamers around the world. Our own homegrown dreamers—doll artists amongst them—have created likenesses of pilgrims, Native Americans, and retro holiday hostesses. 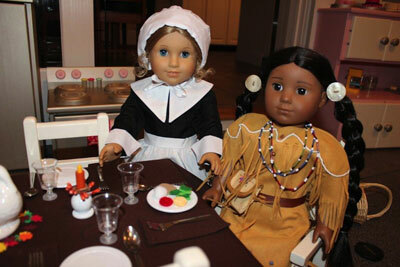 There are lovely examples of dolls that celebrate both the historical and the familial aspects of Thanksgiving. 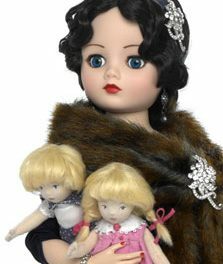 Some of the dolls strive to replicate what the original celebrants wore in their daily lives; others take that long-ago costuming and jazz it up a bit. 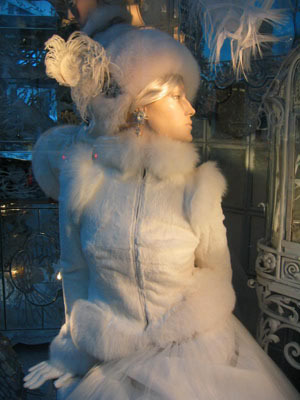 They turn the rather staid outfits into something a little more glamorous and eye-catching. One of my friends, who is a very talented and well-respected artist, worked at one time as a colorist for comic books. His job was to color in the panels of the finished art for printing. One of his assignments was for a comic book version of the First Thanksgiving starring Barbie. He always chuckles when he recounts how he had to color in all the Pilgrims in drab grays and browns and greens, but Barbie and her little sister Skipper were standouts in the familiar pink-box motif. They were dressed in hot pink, white, and lilac. In their bright pastel colors, they were original beacons of freedom! Mattel and Madame Alexander have had a long history of mining American history for doll interpretations. On an annual basis, the Alexander Americana dolls used to celebrate Thanksgiving as a national holiday and a family get-together. 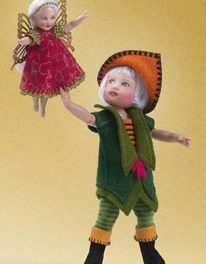 They had dolls that incorporated symbols of Thanksgiving—turkeys, cornucopias, holiday pageant outfits, trips to Grandma’s—with their familiar Wendy sculpts. This year, on their site at least, there are no hits for Thanksgiving. That’s a definite surprise. 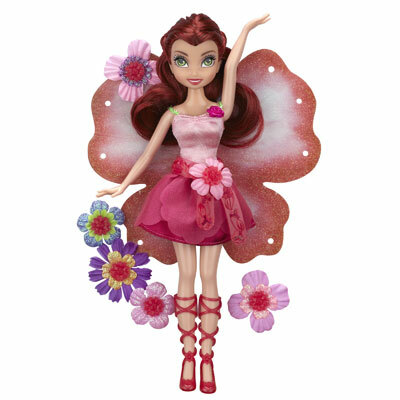 In 2010, Mattel unveiled for its Barbie Club members a Holiday Hostess doll that acknowledged the role a gracious hostess played in putting together a perfect Thanksgiving feast. 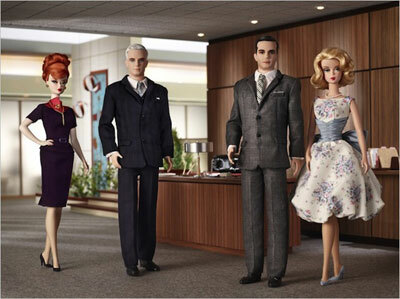 Clad like a cast member of AMC’s “Mad Men,” the doll was a beautifully rendered, retro tribute to the perfect 1950s/1960s ideal of the pulled-together woman who could trim a turkey and tease her hair to dizzying heights. The doll is a great version of what Thanksgiving once aspired to be, just a scant 40 or 50 years ago: a chance for a wife to show off her culinary skills, host a dinner party of family, friends, and husband’s business associates, wear an outfit that showed the family was well-off but not snooty, and rejoice in another successful year of pursuing and attaining the American Dream. Women who plow on the eye shadow, construct beehive hairdos, wear silk stockings and heels, and then cart out a turkey stuffed to its gills is a reality that no longer exists. (Who knows if it ever really did?) 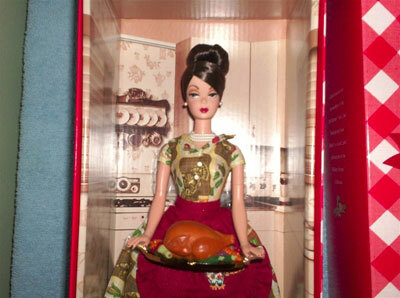 But the 2010 Holiday Hostess doll from Mattel enshrined a woman who managed to get herself all dressed up and gussied up, while dressing a turkey and discarding gizzards and liver. It’s a part of Americana that is as distant to us modern-day folks as the Pilgrims landing upon Plymouth Rock. As you carve your turkey this year—or your tofurkey (tofu and turkey)—think about how long, rich, and continually evolving our country’s heritage is. And then remember we’re among one of the world’s youngest nations. Hopefully, any current difficulties and problems are just growing pains. Believe me, as a mom to a fifth-grade boy, I know something about that as well.